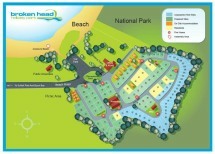 Now there’s even more reason to bring the family to Broken Head Holiday park! Lifeguards will be patrolling the beach out the front of the park these school holidays, up until the 27th of January. That means you can have fun in the sun and relax while the kids have a swim!